Below is a list of the current known issues in Release 211. The following items are fixed. Please try restarting Steam or PS4 to get them. Opening the Settlement details for a “Great City” crashes the game. A few worlds are crashing, including Sorissi. 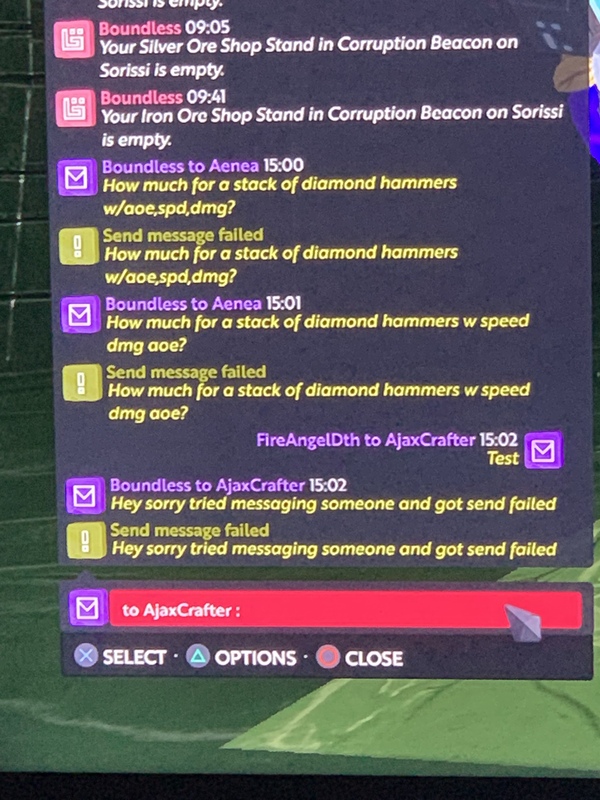 Some players are reporting that their beacons aren’t generating footfall. It’s not possible to open the Right Sanctum Warp to a LOCATION. The work around is to open it to a BEACON instead. Players are reporting that they can’t collect footfall from beacons as the button reports “You don’t have the required Permissions”. The button is simply mislabeled and using the wrong localised string. Footfall does appear to be collected correctly. This will be fixed. If you have multiple alts within a single guild you will not be able to message the guild with all alts. Some players are reporting that they’re only getting less footfall then expected. We understand the following issues and will publish a fix in a future update. Potentially a hotfix or potentially the next development release depending on the urgency and complexity of the code change. Beacon GUI isn’t clear that footfall will only start generating when the beacon has 10k prestige. It reports the footfall per visitor when you hit 10k. It should be clear that you need to reach 10k first. Beacon GUI also isn’t clear that a beacon will not always get the reported amount per visitor. There are a few factors to adapt the payments. This is to try and make the system fairer for all players. We need to do a better job of explaining this. NEW Creating a new PM channel using the lower menu will sometimes not create a new channel. Try to use the top menu if possible. The following items are under investigation. Awaited feedback on latest footfall fixes. Beacons must now have 10k prestige before they generate footfall. This isn’t currently well communicated. All worlds are back online and all players should be unlocked. We’ve applied a fix for the failure hopefully it should resolve the issue that was causing the crashes. All worlds appear to be stable and there have been no more failures. I have spent some time testing the Guild Channels with Alts and there are definitely problems there. The issue is that Atls are not correctly subscribed into the guild channels and guild logs. This was tested extensively - so something must have snuck in late. I’m hopeful it’s a little issue that is causing a large problem. We will investigate and fix the issue ASAP tomorrow. But we will not attempt a fix this evening. As players have reported the Right Warp in the Sanctum doesn’t allow you to open a LOCATION. It does work with opening BEACONS. I’ve just confirmed that this works as expected our Testing universe. Frustrating. Again - we’ll investigate and get this fixed. We’re still exploring an issue where some players are reporting that they’re only getting 1c per footfall visitor. Update OP with details of Release 211.3. We’ve discovered another issue in the footfall tracking of visitors. The implementation and design are not aligned and we’re working on fixing this. Annoyingly the fix is non-trivial and we’ve concluded that it shouldn’t be released today. We fully appreciate that this means that players will loose out on footfall over the weekend. But we need to prioritise stability of the game for everyone - especially over the weekend - and we don’t want to release a fix in a rush without confirming it is stable. We hope everyone can be patient in the interest of stability. We also fixed the issue where an alt guild member would bump the original guild member from guild chat. At the moment you’ll need to rejoin guilds to rejoin the channels. If this is scary - then wait until we automatically fix up the channels in a future update. Creating a new PM with the bottom button will sometimes fail. Please use the top button where possible. We have a hotfix but it will require a client update and hence can’t be deployed until tomorrow. [image] Tried messaging two different people on another planet and got send message failed. But when it was just one word it sent. Is there a limit or something else going on? Release 211: Empires - Guilds and Messaging++! I got tons of people running through my store and zero beacon coins for footfall. The Gyosha Mall is D.O.A. I guess until all/most beacons have aligned or joined the Guild it will stay broke? Also, there is a beacon that won’t align and the menu is grayed out so it can’t be clicked on. same to our place, there are a lot of players quit this game already, and they won’t be join the guild at any point. And most of them between my house and guild linked area. Some of them have 17 weeks gleams club. This may end badly if they dont get on it. This is one of the Q’s I kept asking about. Some people don’t play everyday or have quit. If they are in the settlement and don’t align…it alters my game-play and indirectly griefs me & everyone else in the guild/settlement. Exactly and we have a similar situation in our settlement as well so were just losing coin left and right here. Plus Im betting that why beacons say “You dont have permissions” but let you get the coin anyway because the guild issues. Because since i picked it up this morning none has been added. In case you didn’t already know, Lamblis appears to be down (Websocket closed).